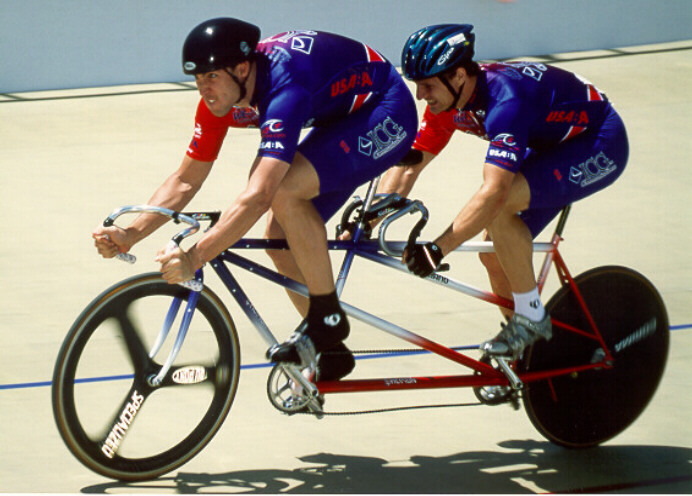 Mark Guerin and Matt King win the Kilometer at the 2000 Paralympic Track Trials in Frisco, Texas. DOB: 03/05/69, San Francisco, Calif.
About Mark: Since a young child Mark was always impressed by his uncle’s racing bikes and Mark’s uncle encouraged him to ride. At fifteen years old, Mark became interested in bike racing competitively, he and a friend started a bike club at Live Oak High School in Morgan Hill, Calif. In 1992, Mark began track racing and won the Southern California District Championships in the Match Sprints. In 1997, racing for Fort Lewis College, he was named an All-American and won National Championships in the Kilometer and the Olympic Sprint. Mark has placed in the last five Elite National Championships, earned a total of four National Championships in Collegiate and Master’s competition. In between racing and training, Mark teaches fourth grade at Pikes Peak Elementary, Colorado Springs, Colo. Mark is married to his wife Gena and has a daughter, Caitlin.